I adore achievements. I like the flash of yellow on my screen and the pop-up announcing what I’ve just done. From the above screenshot, you can see I have over 23,000 points. I’d have more but quite a few were moved to Legacy or Feats of Strength and therefore scrubbed from my total with Battle for Azeroth. We achievement collectors were not happy about that. I decided to go backwards and work on finishing up some old achievements. You can see I’m still going to the Broken Isles to work on 5,000 World Quests Completed. That’s within my grasp. I don’t think I’ll work on the 10,000 World Quests Completed achievement after this, in spite of the amount of gold one can get from doing these. I’m also working on killing 5,000 demons for the And We’re All Out of Mana Buns achievement, which is thankfully the last in the achievement chain for killing demons on Antorus. Going even further back, I don’t have Bloody Rare, nor either of the flying/bombing quests from Burning Crusade. The latter two are a matter of just not attempting them. With faster flying, I can probably get them reasonably easily — but I don’t plan on making an attempt to head to Outlands. 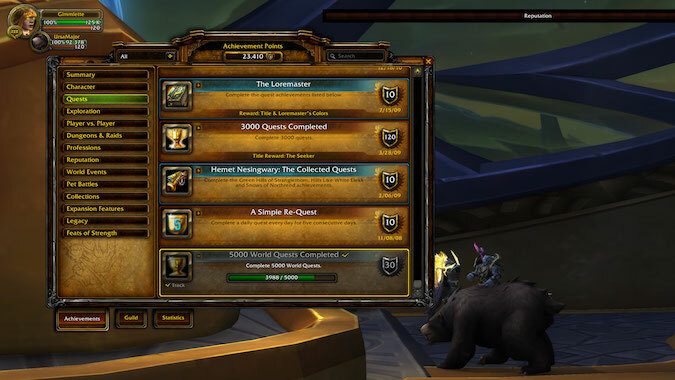 Are you going back to old content to pick up achievements from other expansions? What non-BFA achievement(s) are you working on right now, if any? And finally, confess — what achievement could you probably get, but just haven’t?